Dance Troupe Practice: Do us a Show! Join us for an afternoon and evening of movement, sharing, and mingling! Do Us a Show is an opportunity for performers of all stripes to come together and share new pieces in front of a supportive, inclusive community, and to explore dance and movement in a fun and friendly atmosphere. 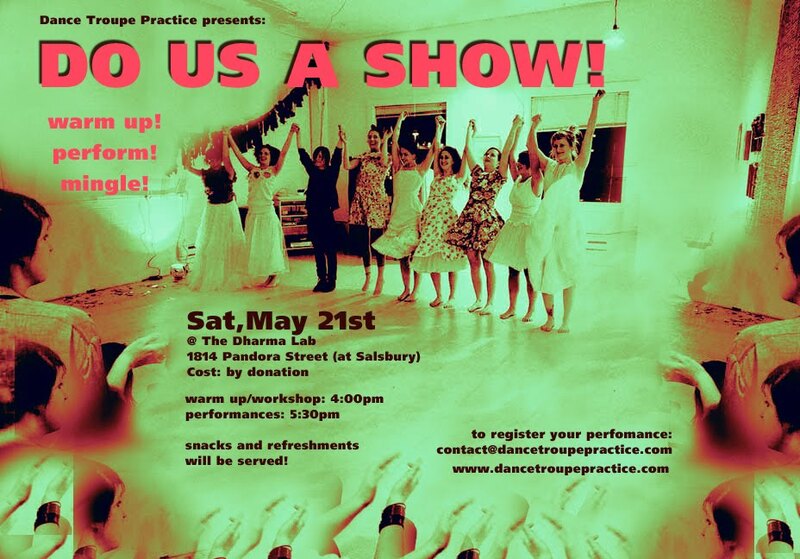 Dance Troupe Practice will be performing a new piece! The format for the performances will be "open-mic" format. 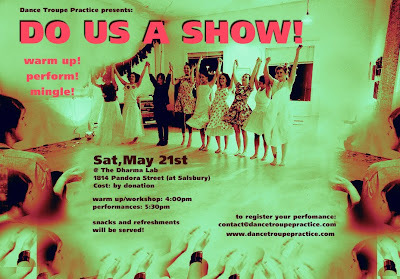 However, if you want to ensure a spot for yourself/your group to perform, please contact us at contact@dancetroupepractice.com to reserve a spot on the schedule. Slots are 15 minutes (but pieces can be less than 15 minutes in length). If your piece is longer than 15 minutes, please choose a segment of the piece to show. Please also let us know if you require a projector or music for your performance. There will be time after each piece for feedback. This is OPTIONAL - performers can ask for feedback or choose not to receive feedback. Dance Troupe will facilitate 5 minutes of critical response at the request of performers. We welcome those who wish to attend without dancing as well.